As a girl, Zainab Khadim Alwan (pictured) cut school to watch American tennis stars Serena and Venus Williams play, imagining herself some day becoming just like them. Even the rocket that blew off her legs four years ago hasn't dampened her desire to play the game. It's just that she now does so in a wheelchair. Alwan is among a growing number of young Iraqis who have turned to competitive sports to learn to live with the physical scars and emotional trauma of the 2003 U.S.-led invasion and sectarian bloodshed it unleashed. It's not easy in a country still suffering from daily violence, and limited help for handicapped people. Alwan and others like her are determined to persevere. "I choose tennis because it's a difficult game," Alwan said. "I wanted to prove despite losing my legs, I haven't lost my mind." About 2,000 Iraqi athletes with disabilities compete in swimming, track and field, fencing, volleyball, shooting, weight-lifting and tennis. More than 20 percent lost their arms and legs in suicide bombings, shooting attacks, roadside bomb explosions and as a result of mortar or rocket fire, according to Iraqi officials. "It was one minute and it all changed," Alwan said, recalling the day she lost both legs. That was in 2006, and her 10 brothers and sisters, her parents, nieces and nephews gathered in the house to celebrate the end of the holy month of Ramadan. Fighting between Shiite and Sunni militias for political dominance was raging across Baghdad, killing dozens of innocent civilians each day on both sides of the sectarian divide. The family was talking when rockets started to rain down. The first fell near the house. The second landed in their backyard. The third hit their house. Everyone fled as the home collapsed, seeking safety in the front yard. It was there that the fourth rocket hit. "Those rockets, (they fell) as if they were following us," Alwan said wiping tears off her face with one hand and gently stroking her tennis racket in the other. "I lost consciousness for a few seconds, then I woke up and saw both my legs were gone." She almost gave up on life after the attack that killed her sister and sister-in-law. She dropped out of school, endured eight surgeries and distanced herself from her family, friends and neighbors. "I could not cope with reality and for a long time I tried to convince myself it was all a bad dream," Alwan said. With the support of her brothers and her father, who refused to go with the social flow of hiding their disabled sister and daughter from the outside world, Alwan got fed up with despair, joined a club and signed up for the sport she liked before the attack. "Tennis relieved Zainab's suffering," said her father, Kadhim Alwan Jassim. With Iraq's violence down from its mid-decade peaks, Iraq's sports clubs have stepped up efforts to show a new generation of disabled athletes that they can still train, compete and triumph. "We try to convince the handicapped people that it's not the end of the world and that life with disability has a lot of potential," said Ahmed Flaih Ajaj, president of Al-Thura Sports Club, specifically created in 2003 for handicapped athletes. The club now has 100 athletes playing basketball, track and field, fencing, ping pong, tennis, weight lifting, swimming and volleyball. The athletes are mostly young and predominantly male, Ajaj said, adding most struggle emotionally before embracing life with disability. "We offer some counseling, but mostly try to convince the handicapped people that sports is the best way to regain physical strength, overcome isolation and start winning again," Ajaj said. Alwan now walks with artificial legs she covers with long, colorful skirts. She practices tennis three days a week and hasn't missed a single training session in two years. She trains in a club with nine men, most of whom also lost their legs in attacks. They take off their artificial limbs, line them up against the metal fence at the tennis court behind Baghdad's biggest soccer stadium and use wheelchairs to play tennis. 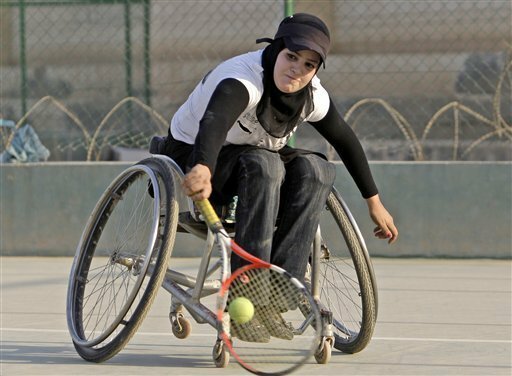 Of 11 players on Iraq's wheelchair tennis national team, Alwan is the only woman, although there are other women who play around the country in wheelchairs. She won the national title twice, in 2008 and 2009, and in May marked her first international success in a tournament in Turkey, finishing third. "After 2003 a new generation of crippled athletes began to emerge," said Qahtan Tayeh al-Naeimi, the president of the Iraqi National Paralympic Committee. The generation before them was made up of veterans of the Iraq-Iran war in the 1980s. The reintegration of those who lost their limbs on the Iran front into society was a priority for Saddam Hussein after the eight-year war, turning Iraq into one of the Middle East's most advanced countries in dealing with disabilities. Rehabilitation centers and sports clubs mushroomed around the country in an attempt to integrate veterans into society and the work force. Tennis - Saddam's favorite sport - was especially popular. Iraq's wheelchair tennis players have benefited from a two-year program by the sport's international governing body to develop wheelchair tennis in Iraq, providing training and supplying athletes with tennis equipment, including specially designed wheelchairs for the game. But Iraqi officials who work with handicapped athletes today say the biggest problem is not the social stigma, lack of funding, or continued violence but the fact that they rarely can attend competitions in Europe and the United States because athletes are denied visas. Only six of 16 athletes on the volleyball team were issued visas to attend the Wheelchair Volleyball Championship in the U.S., sparking an official complaint by Iraq to the sport's governing body. "How long are they going to treat Iraqi athletes as terrorists while they are victims of terrorism?" said Karim Abdel Hussein, the president of Iraq's Wheelchair Tennis Federation that was established in 2003 and joined the International Tennis Federation two years later. Alwan and another top player chosen to participate in a tournament in London earlier this year could not go because the British government refused to issue them visas, Hussein said. For Alwan, training abroad and competing in an international tournament were huge confidence boosts that prompted her to go back to school and even reconsider undergoing more surgery she'd been avoiding. "I'll do it, if will make my game better," she said. "I am determined to win an international tournament one day."